I’m cheating a bit and posting my reflection from our Longest Night healing service, on 12/16/10. 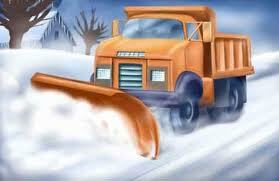 As I began shoveling, the plow thundered down the street. The blade sliced through the drifts, carving a neat edge at the curb. Snow sprayed in a high arc. Just as I turned to continue my work, a second plow rumbled by, smoothing and perfecting the work of the first. Mired in the slow, heavy labor of moving snow by hand, it was truly awesome to watch this process. What power! To make a straight highway in this desert of buried, stuck cars and exhausted shovelers! To lift up the ruts and lower the piles! To level and smooth the rough, uneven, impassible road! A voice cries out: in the wilderness, prepare the way of the Lord” What does it mean to prepare? For what we are preparing? The apparently obvious answer is that we are preparing for a birth, literally, or metaphorically. But what does that look like for those have lost pregnancies, or children? For people who to be long to be parents, but will not have that chance? Our whole culture is preparing to give gifts, send gifts, receive gifts. Yet what about all those who find themselves struggling financially, frayed with the stress of expectations they cannot meet, emptied, rather than filled, by the consumer element of it all. As many make preparations for travel and family celebrations, some are alone by choice or circumstance. Others prepare to cope with family conflict, dysfunction or abuse or mark the first year or many years without a loved one in the family circle. Prepare the way of the Lord. I think of Mary and Joseph. How do you prepare for visits from angels and dreams in which God talks to you? How do you get ready for a birth while homeless… or pack to flee your homeland with an infant under threat of violence? And these fearful early years are only the beginning… for this child will preach to the Rabbis at age 12, will heal the sick and raise the dead, will fall into the hands of Roman torturers, and then… the empty tomb. How does one prepare for this kind of journey? – full of wonder, yes, but at least equally as full of pain and perplexity. After the plows had passed by the other night, I realized that their wake had blocked the end of our alley with yet another pile of hip deep snow. I groaned and forced my aching arms to begin clearing a path. For what are we preparing? How do we prepare? Truly, I don’t know. All I know is that prepare is what we are called and created to do. We are to make a path in our hearts, in our lives, for God-with-us. We are to welcome a mysterious divine companion who shares our grief and carries our burdens. We are to be attentive to one who, with the hands of God and our hands, rearranges the landscape of this world, so that joy and life might travel even on the road of loss and trauma.